The first thing to say is that there already exists an excellent article on this workhouse on the Benfleet Community Archive which can be seen by clicking this link or visiting the website at http://www.benfleethistory.org.uk and putting “workhouse” in the search box. This is because the workhouse housed the poor from Benfleet as well as from Thundersley. (Hadleigh had its own workhouse in Chapel Lane, then “Workhouse Lane”). The Thundersley tithe records of 1838, indicate that there were 2 “poor houses” in Thundersley, one on the south side of Common Lane and the other in Hart Road. Each was owned by the parish and presumably given by wealthy local benefactors to be made available for temporary occupation by the local poor. 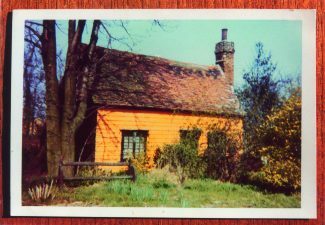 The first may have only been a garden for growing produce to be used by the paupers living in the second which, from parish records, appears to have jointly housed the poor of Benfleet and Thundersley. One cottage remained for many years of the three probably originally forming the “poorhouse” next to Swans Green on the south side of Hart Road. It was eventually demolished in about 1960. (See Terry Babbington’s book, “Thundersley, A Pictorial History”, now out of print, but available in local libraries). From Benfleet Archive information, taken from a 1956 journal by W. T. Phillips, the workhouse was set up in 1797 with 6 spinning wheels, so the poor could be taught both to knit and to spin, giving them a useful way of eking out a living. In the Benfleet article, an inventory has been shown to indicate a kitchen, bakehouse, “keeping room” (day room), pantry and probably 2 bedrooms. The St Peter’s parish records and the 1832 workhouse governor’s journal provide further details, including that it was built using bricks from “Hadleigh Kiln”, presumably in Kiln Rd, and used wheat straw for thatching. A master (Peter Parmenter in 1835) was appointed to look after 20 people to provide 3 hot meals per week and teach them spinning and knitting. Boys wore white kersey jackets and breeches, blue stockings and thick yarn cap; girls blue stuff gowns, stockings and skirts and matching bonnets. There is no obvious mention of any “poorhouse” by the time of the 1841 census and the workhouse had closed in November 1836, apparently with the remaining residents transferring first to the new Billericay Union workhouse from 1840 and later to the Rochford Union Workhouse in 1848.